MXR’s phasers are considered to be the staple of this effect category. Van Halen was crazy about the old Phase 90, and the Phase 100 made that package even better. By today’s standards, neither of these two pedals are all that sophisticated, but they offer a sound that people got used to. This came to a point where getting an MXR phaser is a logical thing to do for most guitar players around the world. As you probably know, these are now made by Dunlop, therefore just increasing their appeal since they come with the quality control of a large brand. MXR Phase 90 was as simple as they came back in the day. At the same time, it was a state of the art effect pedal which attracted a lot of well-known and not so well-known guitars into its camp. MXR M107 Phase 100 took that successful design and built on it until it reached a new level. Overall, it’s the same orange box only this time it’s a double wide. Phase 100 comes with an additional knob in addition to the one we are familiar with from the Phase 90. Build quality is as robust as you would expect it to be. Both the case and the innards can take any amount of abuse you are capable of dishing out. Having that kind of reliability is paramount to a lot of users, which is why the orange camp keeps on growing. Controls you have available on the MXR M107 Phase 100 are not modern in terms of range nor capability, but they definitely allow you to shape the tone with enough precision. Aside from the standard Speed knob that Phase 90 came with, this time you get an additional one described as Intensity control. This feature offers four different phaser ‘shapes’ which are neatly described bellow their respective positions. While these are not too flexible, in other words you get to pick very specific phaser shapes, they offer a good amount of versatility. More than you would expect when you see them laid out on the paper. The type of tone MXR M107 Phase 100 has to offer hasn’t changed much over the years. When you count for the fact that this pedal has been around for a good while, and it still remains one of the most trustworthy phasers out there , you realize MXR did a good job. The tone is pretty pure and clean. Different phase contours are well defined, and respond pretty good to both clean and distorted channels. Even though you only have Speed and Intensity controls, with a bit of tinkering you can dial in a great phaser configuration for whatever music you’re playing at the moment. 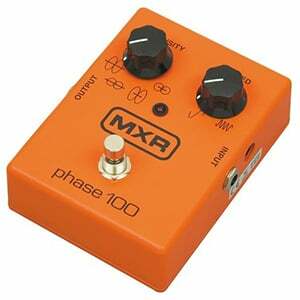 MXR M107 Phase 100 is a great example of quality not necessarily requiring complexity. 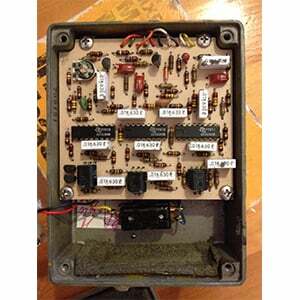 The pedal is an old design that is still going strong to this day. Compared to some modern solutions, it does come across as conservative, but that is exactly what a lot of users are looking for these days. 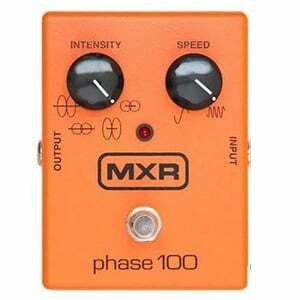 For more info about the MXR M107 Phase 100, click here.